The rush and excitement of Christmas is at fever pitch in our household, the voice of Nat King Cole is on continuous rotation, and the smells from my Hubby’s handy work in the kitchen is making everyone hungry. 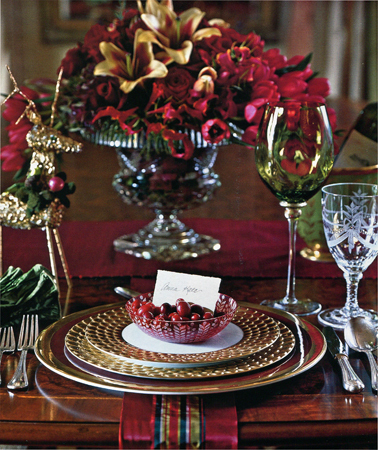 I am busy finishing last minute floral arrangements and setting the table for Reveillon. In New Orleans, the elaborate feasting known as Reveillon has been taking place all month, but we like to celebrate on Christmas Eve. I get to DJ, so the evening is filled with my special line-up of holiday music and there is lots of laughter and love shared between family and friends. It’s my favorite night of the year. Before the celebration begins, I just wanted to take a minute to wish you all a very Merry Christmas wherever you are in the world. I hope that this holiday season brings you all of the joy and love that your heart can hold.